After doing the 24/8 link-up I was pretty keen to move on to preparing for some spring projects. Before that, I had some family time for a couple of weeks and then drove straight to Loch Maree. I have a 50m long project there, in the 8c+ ballpark. 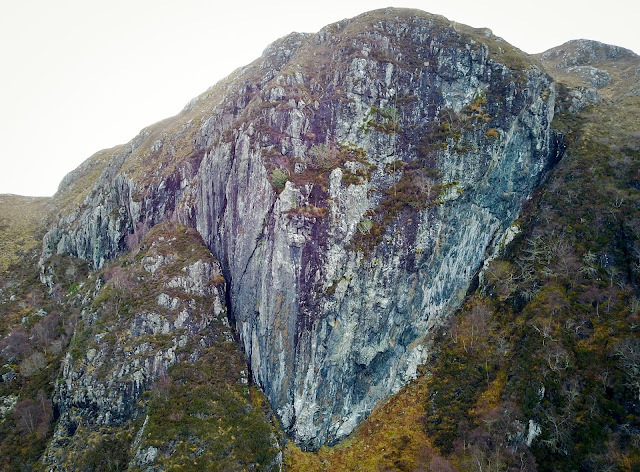 It has a lot of pumpy climbing to get to the crux boulder problem right at the end, and I’d spotted a variation going out left just before the crux onto a route I’d done last year called ‘The Circus’. 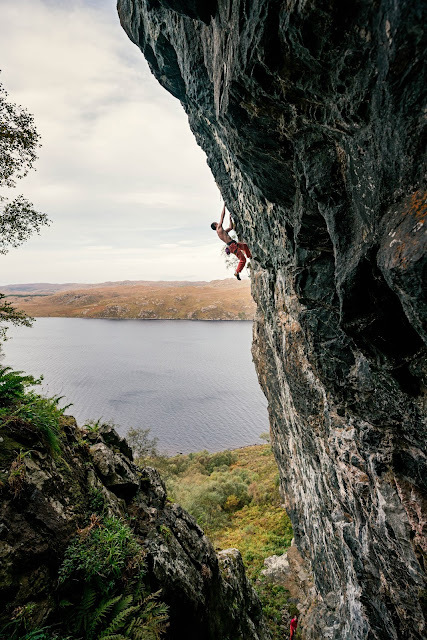 This would be perfect for getting familiar with the bottom part of the route as well as gaining some fitness after a long winter of bouldering and then two weeks with almost no climbing. More than 20 sport routes here now from 6b-8b/+ and my 8c+ project. 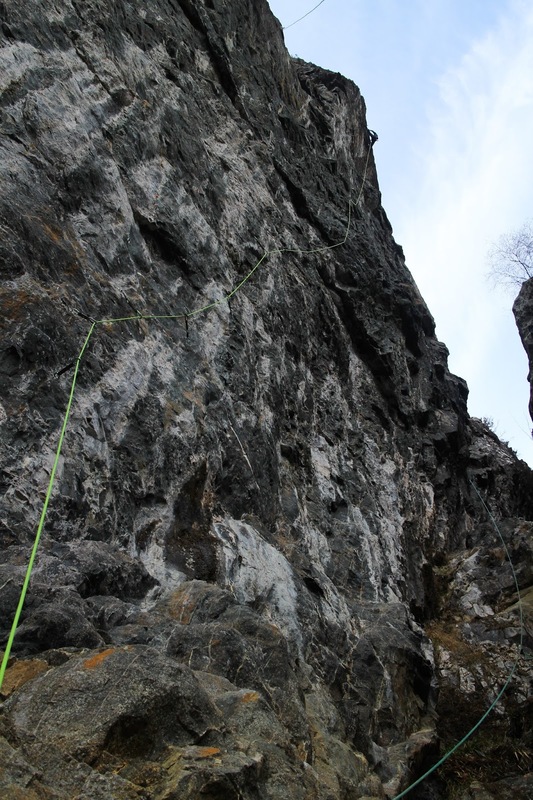 Routes up to 50m long and climbable in the rain. Pretty good. Although definitely not a crag to miss the pre-midge window! If you are gonna go there, go there now! Various issues (jet lag, glassy skin and a bout of food poisoning) slowed me down a bit on the first day there with Murdo and I didn’t quite make it to the top. But on the second day I felt rather better and got it first try. I nearly blew it three metres from the top when part of a hold broke with my other hand mid-reach. I was lucky to stay on. Although it’s a link-up, it’s a pretty amazing one. The climbing is a good and varied as you’ll get in the UK in fact. I’ll call it ‘Spring Voyage’ and give it 8b/8b+. I hate split grades but I’ve not done any sport climbing for a while so just don’t have much of an idea at the moment. And given its length, theres not much to compare it to locally! Its probably a bit like Kalea Borroka 8b+ in Siurana, less sustained but with a rather harder crux. Either in an effort to give myself another route to get fit on, or put off getting fully involved with the 8c+ a little longer (I’m not sure which), I also bolted another line. A direct finish up the leaning headwall above Hafgufa. I reckon that one will come in around 8b+ as well, with a superb crimpy crux section on the headwall after a lot of climbing below. I’ll get involved with that tomorrow. Although there’s nowhere I’d rather be climbing than here in spring time, I always have one eye on whats coming next. It’s rather wet at the minute, so I’m hoping these sport redpoints will serve to set me up for getting back on my E9 project on Binnien Shuas which I was cleaning the day before I broke my shoulder last July. I’m watching the forecast for the first warm days of May when I can pick up where I left off with that one. It also has 8b+ climbing, but thankfully mostly well protected. 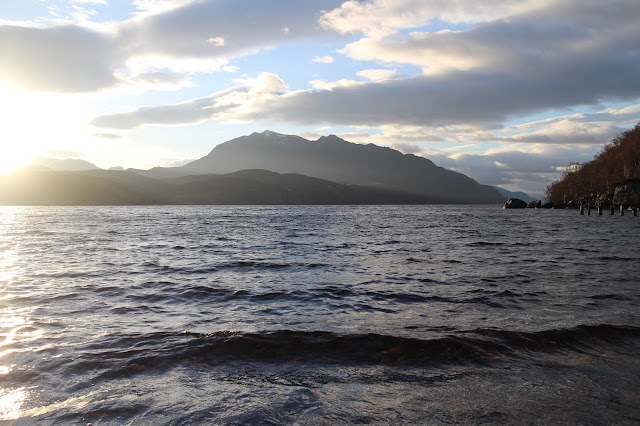 View from my tent at the end of Loch Maree. Pretty good place to hang out. As promised, here is some video of me climbing Gutbuster 8B+ at Dumbarton Rock back at the end of the winter. I’ve been so busy going out climbing I’ve never got round to putting this together. Enjoy. Thanks to Paul Diffley at Hot Aches Productions for the old footage of my initial attempts, back in the day.